The tour of La Gomera begins at 8:30am while pickups take place earlier. The excursion to La Gomera Island from Tenerife takes place 5 or 6 days a week, depending on the provider. We are comparing South Tenerife La Gomera Tour Prices from leading ticket suppliers and Try to find you Cheap tickets prices on the market. The "From South Tenerife: La Gomera Tour" is a pleasant outdoor experience that takes you to incredible nature of the neighboring island of Tenerife. 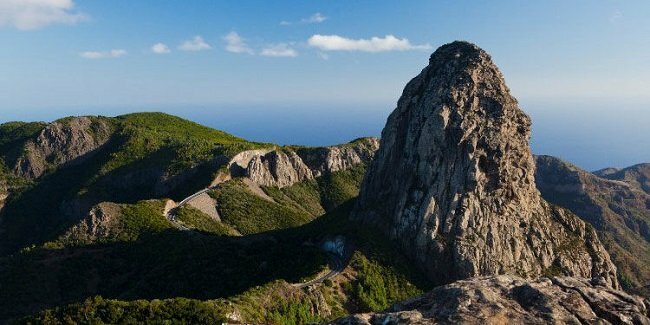 La Gomera Island features magnificent rock formations that have a power to inspire awe and admiration. The island also features unique and extraordinary vegetation. A fast ferry takes passengers between the two islands, and the one-way trip lasts up to 1 hour. Once on the island of La Gomera, you will walk along streets of San Sebastian and discover its top attractions. One of those is the place where Christopher Columbus spent time before discovering America. The bus takes tourists to the Las Carboneras viewpoint where the traditional lunch awaits. The excursion also includes traveling through a beautiful forest. Trip to La Gomera is both enriching and revitalizing, as stated by many people who joined the tour. Hence, it is ideal for anyone craving to learn more about the Canary Islands and relax in the beautiful environment. Your Experience With South Tenerife La Gomera Tour? On this excursion, you will experience some of the most beautiful landscapes of the Canary Islands on La Gomera Island. Tour places that feature a big natural significance as you get around. Travel through forested areas and have lunch at the viewpoint that reveals magnificent views of the surrounding area. Admire attractive, unspoilt and preserved areas from mass tourism featuring unique flora. Visit the place where Columbus prayed before he set off on a voyage that discovered America. What South Tenerife La Gomera Tour Includes? The excursion to La Gomera Island includes pickups in the south part of Tenerife Island and complimentary transfers. Trip on board a fast ferry is part of this unique activity. Professional guidance is offered by a knowledgeable and friendly tour guide. Lunch at a vantage point is also among amenities related to the excursion. Prepare and take warm clothes with you on the trip to La Gomera Island. Many natural attractions you will see on the La Gomera tour are of great importance. Plucking flowers on the island isn't allowed. Travelers Reviews about South Tenerife La Gomera Tour? The rating of this day trip is 4.5 out of 5 on the Get Your Guide and Viator websites. Tourists have a great opinion about this excursion for the most part. They had a great time while sightseeing and having lunch. They also underlined a good organization of the trip to La Gomera Island. The guided tour of the island of La Gomera isn't suitable to people with disability issues. Both mobile and paper vouchers are valid for joining the day trip to La Gomera Island. If you need to cancel your attendance, you will be fully reimbursed for timely cancellations. Ensure that you have layered clothing due to varying temperatures. Please don't forget to bring a passport or other personal ID because it is necessary for boarding the ferry. Besides clothing, have water, sunscreen and sunglasses at hand. The tour begins with the pickup from your hotel.